Are you looking to support a homeless charity this winter? Could you help us raise vital funds to support our work with homeless people in Swindon? Big Breakfast Plus needs you! Big Breakfast Plus is a registered charity that has supported and served the homeless in Swindon since 1993. We offer a free cooked breakfast 7 days a week for homeless people in Swindon and we’re proud to serve over 7,000 hot and freshly cooked breakfasts every year! But it doesn’t stop there. 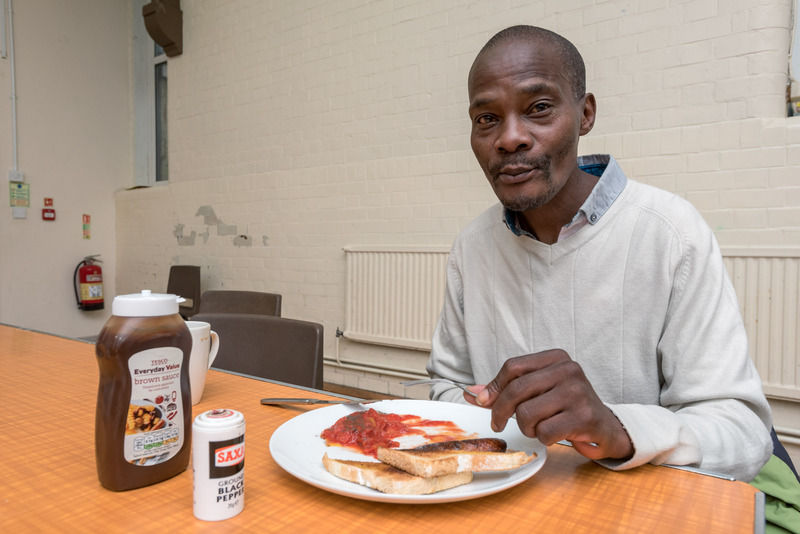 Big Breakfast Plus gives homeless people the chance to relax and socialise in a warm place and offers easy access to important local support services through partner agencies including Threshold Housing Link, Swindon Borough Council and Swindon Night Shelter. Our service is based in Central Swindon and is open from 7-9AM Monday to Sunday. Annually, we welcome over 550 different individuals who are rough sleeping, sofa surfing, or have no access to cooking facilities or income to pay for food. As we move into the colder months, demand for our service has increased. We served almost 1,000 breakfasts in October alone, and our reporting suggests we are on the way to serving 9,000 breakfasts a year by 2019. Big Breakfast Plus receives no statutory or local authority funding and we need to raise £500 a week to support our service. That’s where you come in. On this page you’ll find some fun, festive fundraising ideas to help us raise vital funds to support our homeless guests this winter. Sponsor a breakfast instead of sending cards in the post. Did you know that for the price of a packet of Christmas cards, you can sponsor a breakfast for a homeless person in Swindon? It’s quick, easy and environmentally friendly too! 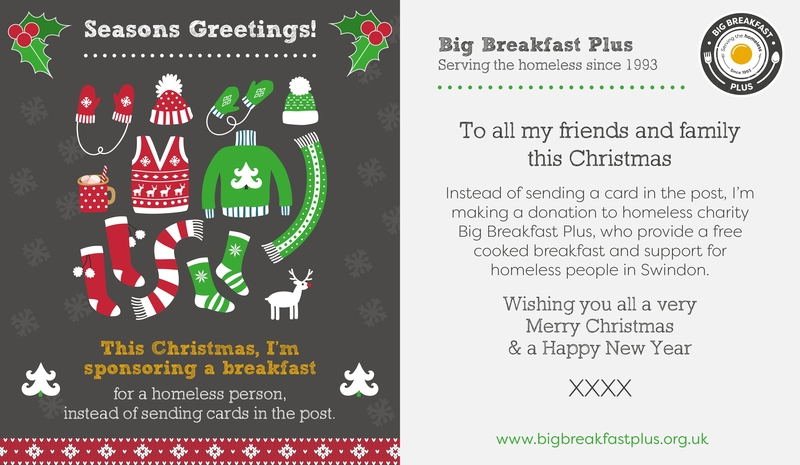 What’s more, when you sponsor a breakfast for just £5, you can download our free festive e-card for friends, family and Facebook, letting everyone know that you are supporting the homeless this winter, instead of sending cards in the post. Pop along to our fundraising appeal page and make a donation to the value of the Christmas cards you usually send. Finally, click on the e-card image below and save to your phone or laptop, to share with friends and family. Easy peasy. Looking for a fun, festive activity for your workplace, school or group? 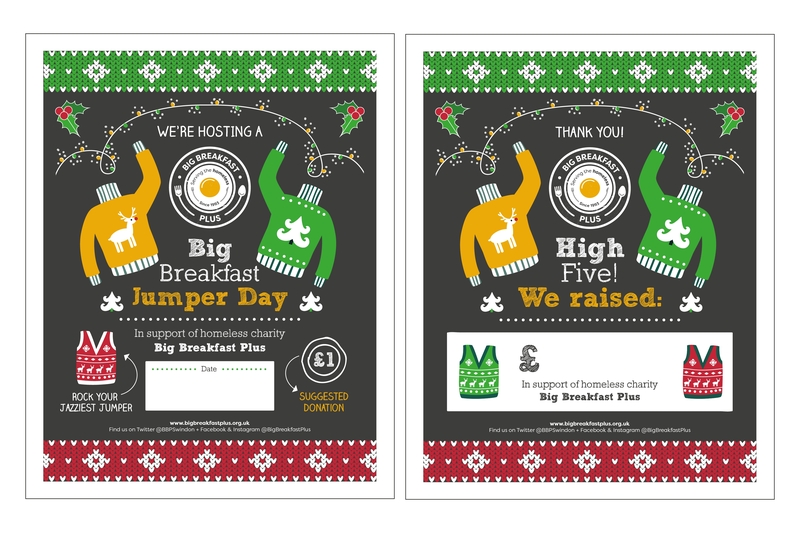 Why not host a Christmas Jumper Day in aid of Big Breakfast Plus? It’s super easy to organise, just set the date, rock your jazziest jumpers and collect a donation from colleagues and friends. To make organising your Jumper Day as easy as possible, you can download our free poster templates to let people know about your fundraiser and tell them how much they’ve raised together. We’d love to see your festive knitwear, so make sure to tweet us @BBPSwindon, or tag us on Instagram and Facebook @BigBreakfastPlus so we can share the fun and say thank you. We’re also happy to arrange for someone to collect your donations, just email hello@bigbreakfastplus.org.uk and we’ll get it sorted. Thinking of becoming a regular donor? Hold that thought! From 10am on 11th December 2018 LocalGiving will match monthly donations by up to £10 for a full 6 months for donors who set up a direct debit to a Localgiving member (that’s us!) for a year. A regular donation of £10 from you, could be boosted from £120 to £200 in match-funding over the course of a year. Sounds good right? 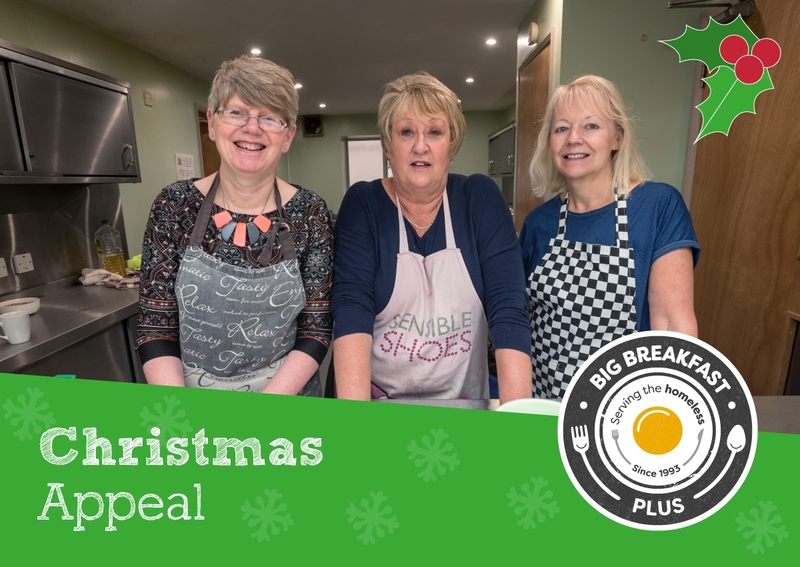 For your regular donation to qualify for the match-funding, all you need to do is set-up a monthly donation to Big Breakfast Plus after 10am on 11th December 2018, whilst the campaign is live to secure match funding on your gift. You can find out more about Grow your Tenner on the LocalGiving website. Big Breakfast Plus is a small charity that makes a real difference to the lives of homeless people in Swindon. However you decide to support us, your contribution matters and will help us continue our work in 2019 and beyond. On behalf of the staff, volunteers, guests and trustees at Big Breakfast Plus, we wish you all a wonderful Christmas and a Happy New Year. Big Breakfast Plus guests organise friendly football match to boost wellbeing and increase participation in sport. Can you help? Big Breakfast Plus is a Registered Charity (1063917) that has supported and served the homeless since 1993. We offer a free cooked breakfast 7 days a week for homeless people, as well as easy access to support services including health, welfare, housing and addiction.